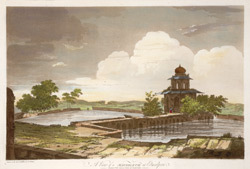 This is plate 36 from William Hodges' book 'Select Views in India'. In 1783, while venturing towards Agra, Hodges pased by a number of small towns, one of which was Etmadpur. At that place he noted a pavilion built in the centre of a tank. Hodges believed that this building was a mausoleum, but in fact, it is the Burhia ka Tal, a water palace built by Itimad Khan in the 1570s. Itimad Khan's tomb is on the edge of the tank, and is the vantage point from which this picture was made.